The Soldier and the Demoman are the next Team Fortress 2 classes up to get shiny new toys, but there's a twist - whichever class kills the other more during the next week will receive a secret fourth bonus weapon. 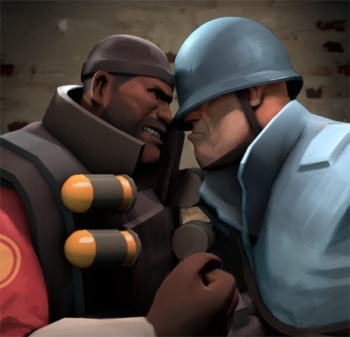 Yesterday, we learned that Valve would be setting the Demoman against the Soldier for its next Team Fortress 2 class update. Like the "Sniper vs Spy" update from earlier this year, updating two classes at once means that there will at least be a relative balance rather than everyone rushing to play one specific class - but this time, there's a twist. According to the TF2 Blog, while the "Demoman vs. Soldier" update will be like its predecessors in many ways - each class will get three new goodies rolled out over the next few days alongside new achievements, maps, and perhaps even new gametypes - there is one little twist: The TF2 team has developed a seventh, top secret item. Whichever class kills more of the enemy over the course of the update's reveal will be awarded this fourth item, exclusive to their class - and more importantly, not exclusive to the hated enemy. Given Valve's reputation for balanced multiplayer in TF2, my gut inspiration tells me that this probably won't be an actual weapon, but a small, little "flavor" item much like the game's hats. After all, why would a game that prides itself on its multiplayer balance give one class a permanent advantage over another? Then again, I could be wrong. So which is it, Escapareenos? Demoman or Soldier?